First class service ,next day delivery. Will defiantly use Tayna Batteries again and recommend to others. Thanks. Works well. Fitting was easy too. Excellent fits in the space taken up by the old 6V battery (have converted the bike to 12V electrics) electrex 12V conversion., havn\'t fired it up yet still installing the rest of the loom etc. 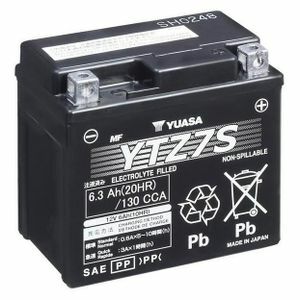 First I was sent a cheap "noname" YTZ7S alternative but when I complained I recieved the correct Yuasa battery, so Im happy overall. Product worked, delivered quickly. Expensive compared to others, but hopefully worth the premium price.